Quiet private camping site- 11 pitches mainly for TENTS. Sheltered from West and North winds by a belt of maturing trees. 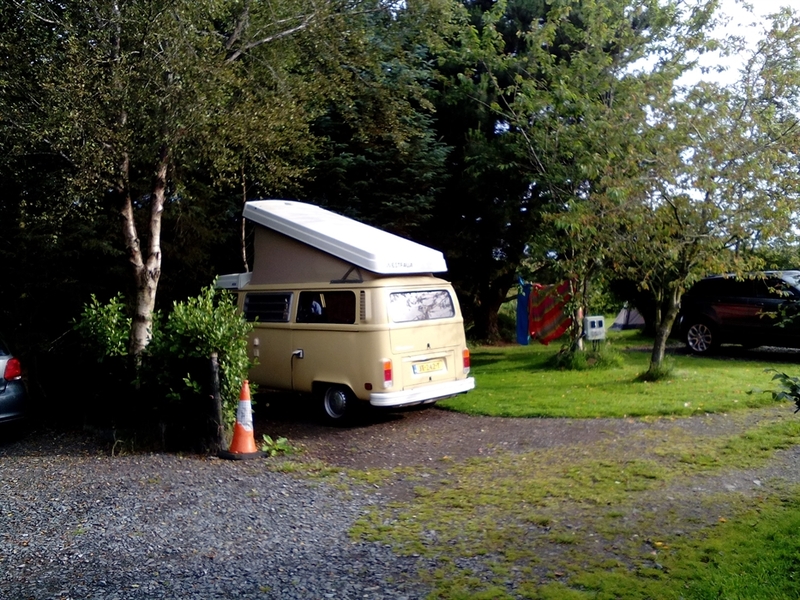 Electric hookups, 3 CAMPERVANS accepted. ONE new CAMPING POD FOR 2. Modern facilities block. Children 8 years and over welcome. 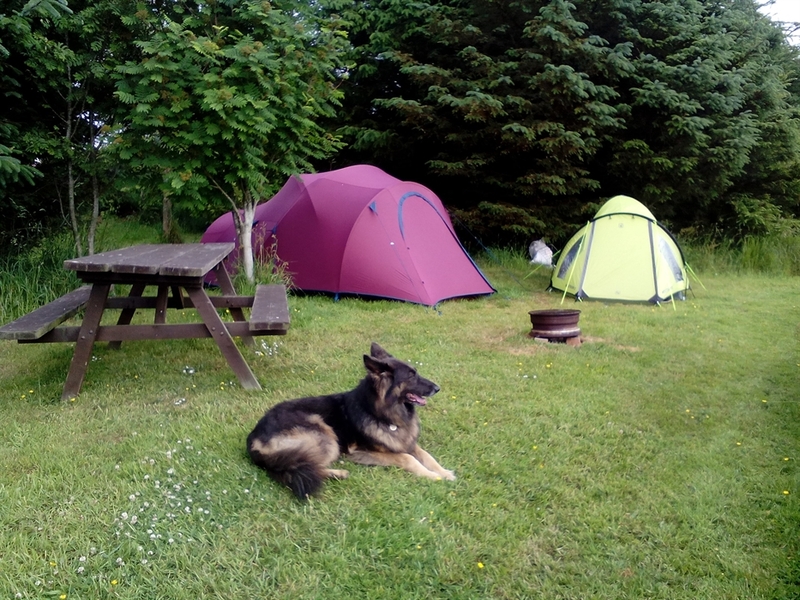 Dogs and pets by prior arrangement with campsite. This is a small quiet rural camping site with 10 TENT PITCHES, well spaced out, of which 3 HARDSTANDINGS FOR CAMPERVANS under 6 metres. SIX pitches have electric hook-ups. New Addition ONE CAMPING POD SLEEPS 2, IN COMFORT. Ask for details. We have a modern facilities block with free shower, hotwater, 2 toilets with private washbasins. Washing up sinks with free hot water. Fridge-freezer,shaver point and electric sockets. Dogs and children welcome. Rural site, sheltered by trees. Woodland area. Campfires and BBQs allowed. Some picnic tables for campers use. Rain shelter. Firepits for campfires provided, we supply logs, kindling and firepit from £6. Prices are per person, not per pitch. £9 per adult, childrent 2 - 15 years £4.50, under 2's £0 /Electric hookups £3.00 pn. Tents more than 6 x 4 metres may be charged extra. Discount prices in the off-season. People with disabilities welcome. Some pitches have level access from the gate and facilities building. Hardstandings are compacted quarry waste. No step into the facilities building. Wheelchair accessible toilet with washbasin. Full grabrails in place. Wet floor shower with shower stool, and space for carer, to assist. Cars are parked in designated parking areas, but if you need your car beside your tent we can allocate a specific pitch, but you must discuss your needs when booking. 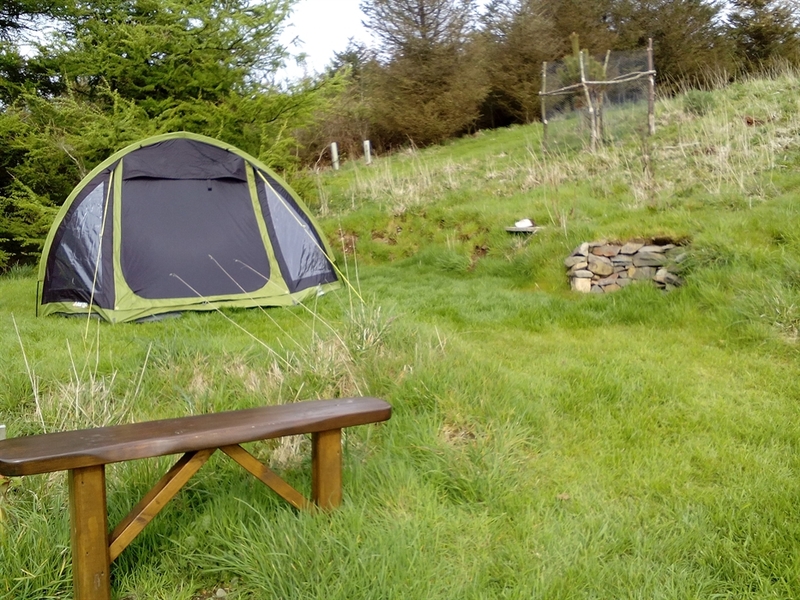 We offer a small quiet rural camping site with 11 pitches for tents, of which 3 can be used by small campervans (max 6.5 metres) ON HARDSTANDINGS. 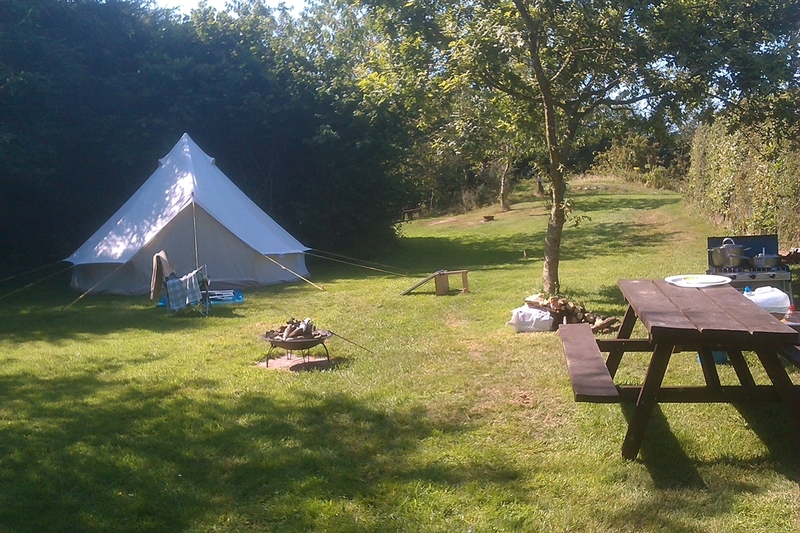 ONE CAMPING POD WITH BEDS AND ELECTRIC with satellite TV £35 a night for 2 people. SIX pitches have electric hook-ups. We have a modern facilities block with free shower, hotwater, 2 toilets with private washbasins. Washing up sinks with free hot water. Fridge-freezer,shaver point and electric sockets. Dogs and children welcome. Rural site, sheltered by trees. Woodland area. Campfires and BBQs allowed. Prices are per person, not per pitch. £9 per adult, childrent 5 - 15 years £4.50, under 5's £2. Tents more than 6 x 4 metres may be charged extra at peak time. Discount prices in the off-season. Groups and People with disabilities welcome. Some pitches have level access from the gate and facilities building. Hardstandings are compacted quarry waste. No step into the facilities building. Wheelchair accessible toilet with washbasin. Full grabrails in place. Wet floor shower with shower stool, and space for carer, to assist. Cars are parked in designated parking areas, but if you need your car beside your tent we can allocate a specific pitch, but you must discuss your needs when booking.